It is pleasing to see Jeremy Corbyn get something right, for once. A couple of months ago, he recorded this video message in support of Hungarian socialists, rightly warning how their country was in danger of becoming home to despotism, although he put it more politely. In his words, that the far-right government “is not only weakening democracy, but allowing intolerance and racism to take hold” (ok, so the irony meter in the Leader’s Office was switched off that day). In contrast, our country’s government, in the person of its idiot Foreign Secretary, was quick to congratulate recently reelected president Viktor Orbán in a lugubrious tweet, failing to mention his racist campaign, or his fixing of the media and electoral system to win. I suppose that, in the post-Brexit world, his low calculation is less maintaining a democratic continent and more “any port in a storm”. As Nick Cohen pointed out recently, Orbán is – like Putin – starting to treat harmless NGOs as enemies of the state. Not to mention demonising one of the country’s great entrepreneurs and philanthropists, George Soros, by fabricating ridiculous stories that he will flood the country with immigrants (he is clearly neither a government nor standing for office). As Cohen says, “It’s as if UK ministers were pretending the choice before the electorate was between the Conservative party and Human Rights Watch.” Quite. But more of Soros later. Back to Budapest, where I was last week. A beautiful city and not – not yet – the seat of a dictatorship. But it very soon is likely to be, as its election a matter of days ago has largely demonstrated. Not only did Orbán’s authoritarian Fidesz party win (again), the anti-immigration rhetoric seems now to have reached fever pitch. And that’s before we even start with Jobbik, an ugly and even more far-right party, which came in second with a fifth of the vote. In short, the “top two” choice is now between the far right and the really far right. To listen to Labour’s frontbench yesterday would be to think parliamentary democracy lay in ruins because the government had not called a vote on Syria before intervention. A frequent refrain in the House is that there is no more serious issue than that of war or peace. Few would disagree that Parliament should be central in these matters, but the unasked question yesterday (certainly by Jeremy Corbyn) was whether the Syrian mission constituted war. Labour’s leader drew the parallel with Iraq, where there was a vote before deployment. But is Labour really saying that a single bombing raid is the same as a war? Iraq entailed an air, sea and ground operation involving thousands of armed personnel on a mission that was planned to go on for months into years. Syria involved four planes on a sortie that took minutes. One of the worst aspects of parliamentary practice is the way precedent is so rapidly ossified into hallowed practice and wreathed in constitutional piety. After the precedent of the Iraq vote in 2003, now every action, no matter big or small, is subject to the same threshold for assent. It was right that there was a vote on Iraq just as it was right that there was a vote on the operation in Libya, but not the interventions in Kosovo, Sierra Leone or the bombing of Iraq in 1998 in operation Desert Fox. These latter three were much nearer to Syria and in no way comparable to the Iraq war or even Libya. The one anomaly in recent times has been the response to 9/11 with the invasion of Afghanistan – there wasn’t a vote but should have been for the same reasons there was a vote before Iraq and in 2011 before Libya. Jeremy Corbyn was right in his speech yesterday – the Convention which was articulated by the Tories in 2011 and accepts the need for a Commons vote before military action on the basis of the 2003 Iraq precedent, is broken. But not because it needs to be hardened from what is effectively an accepted guideline, into a fully-fledged War Powers Act as Labour will propose in the debate today. Instead the parliamentary process should reflect the reality that a raid is not a war and not every action merits a full vote in the Commons, complete with fevered build-up, publicity, vote wrangling and contentious discourse. It’ll soon be 35 years since Corbyn became an MP – more than half his life. During that time he’s never experienced a government he agreed with – as his record of voting against New Labour showed – and never had to make a decision. Although I’m sure Corbynistas will disagree, I – and I’m not alone – see him, and his ilk, as primarily defined by what they’re against as evidenced by his involvement with the Campaign Group, CND, Stop The War, etc. His position on the bombing of Syria is an inevitable product of a lifetime in this type of politics. Since he became leader he’s encountered, possibly for the first time, those who disagree, sometimes fundamentally, with his positions and undergone scrutiny from the media; at the risk of mixing metaphors he’s been found out and the chickens are coming home to roost. His unwillingness, or maybe inability, to condemn the IRA was telling. A lot can be learned by listening to him and others such as Diane Abbott. Under questioning they develop a slightly exasperated, weary tone as if they find it difficult to comprehend that anybody could possibly disagree with them. This can also be seen by looking at his responses to the attempt to murder Sergei and Yulia Skripal, the response to Assad’s atrocities in Syria and the issues around anti-Semitism in the Labour party. Pointing the finger at Russia on the Skripal affair easily passes the “beyond reasonable doubt” test and – although Trump is yet to tweet it – even the US expelled 60 spies, sorry, diplomats! However, when you backed the losers in the cold war and have appointed apologists for Stalin and Putin to your inner circle…. Let’s try an experiment. Since anti-Semitism is a form of racism, let’s simply use the word “racism” as we outline the following facts. Had a sister party in another country suspend relations with it over perceived tolerance to racism. It’s not pretty, is it? Dominic Raab is a fool. He’s a fool for thinking he could say house prices have risen by 21% because of immigration over the past 25 years and not have to answer follow-up questions on the provenance of this number. It’s a striking figure, of course people are going to ask for the source data. To not anticipate that his Sunday Times interview would generate a chorus of questions from opposition politicians, journalists and think tankers, shows an amazing inability to think through the political consequences of his actions. He’s a fool for not understanding that the UK Statistics Authority has a remit to police the misuse of government statistics and that his department, the Ministry of Housing, Communities and Local Government (MHCLG) is mandated to comply with their rigorous code of practice. A scintilla of comprehension about the role of the Authority would have meant he’d have known that they would publicly slap him down ,as the questions rained down, for not publishing the data and force the department to make it available. Most of all though, he’s a fool for cherry-picking this figure from research which, now the department has published it, makes the exact opposite point to the one he aired in his interview – immigration actually has a comparatively small impact on house prices. 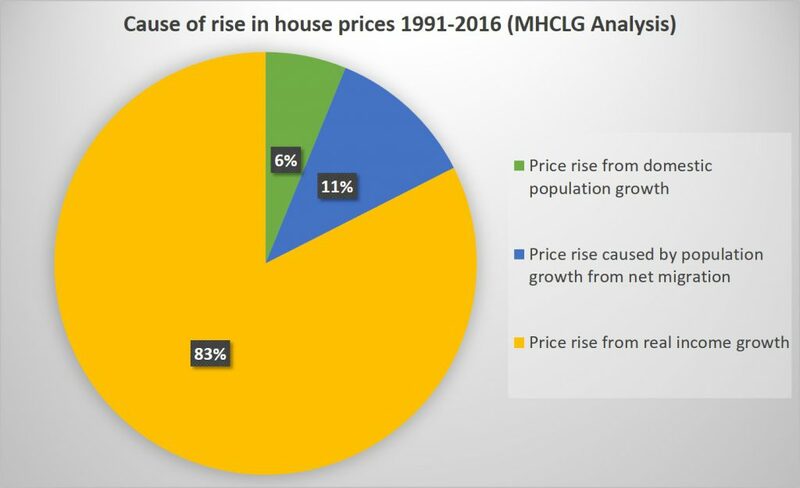 The research ascribes three factors as driving house price rises: domestic population growth, population growth from net migration and increasing real incomes. Out of a total increase of £97,000 1991-2016, £80,000 is from increasing real incomes, £11,000 is from population growth driven by net migration and £6,000 from domestic population growth. By any measure Jeremy Corbyn has had a bad month or two. He was far too slow to react to the controversy over Anti-Semitism and, perhaps, even indifferent to it. On the Skripal front Corbyn’s anti cold war instincts may be understandable, indeed admirable, but the tone and manner of his interventions over Russia simply struck a wrong chord. The perception of those outside of the Party’s membership is that Corbyn only took a ‘proper’ line when dragged to it by the press, public opinion and the views of most of the world’s political powers. Let us not also forget three high profile sackings. First off, Corbyn’s office announced that Debbie Abrahams had stepped down as shadow Work and Pensions Secretary as a result of allegations of bullying made by her office staff. Abrahams herself made it very clear that she considered she had been sacked and countered by claiming that she herself was the victim of bullying from the leader’s office. Owen Smith was sacked over calls for a further referendum on Brexit despite the Party’s conference policy still holding this out as a possibility if the May’s eventual deal proves to be unacceptable. Officially General Secretary Ian McNicol resigned, but effectively he went when the leadership told him his time was up. On leftist social media channels Corbyn’s supporters remained out in force, defending their leader’s stance, until the Leadership itself was forced to reposition itself. In the narrow and rarified world of Facebook and Twitter, loyalists are convinced that Corbyn and his team have been dragged into these new positions by the dark forces of the press when, in reality, they have been responding to the concerns of the wider electorate. This weekend YouGov’s polling — taken during this turbulent period — shows that only 31% of the public think Corbyn is doing a good job as leader of the Opposition; 56% think that he is doing a bad job. In many ways the greatest frustration over the last couple of months is that so many of our problems have been self-inflicted. On Russia Corbyn could have better defended his position if his statements had been more measured or more statesman like. In talking to a number of younger, and newer, Labour members over the last few weeks I have sensed a growing confusion or disenchantment with his Leadership. Some of Corbyn’s most fanatical supporters still refer to him as ‘magic grandad’ but you don’t have to search very hard to find many who are becoming more muted.